Died - 14th August 1920 aged 28 yrs. 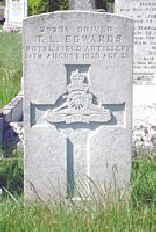 Son of David and Mary Edwards, husband of Gertrude Frances Edwards, of 17, Herbert St., Abercynon, Glam. Born at Abercynon, Glam.